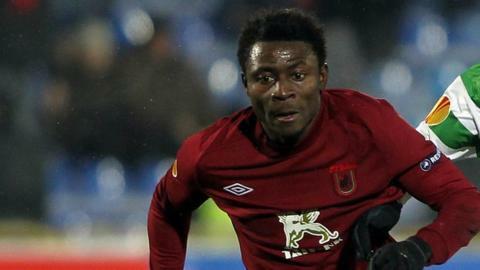 Nigeria striker Obafemi Martins has completed his move to Spanish side Levante from Russian club Rubin Kazan. The striker, 27, joins on a two-year contract in a free transfer after Rubin agreed to terminate his contract before its expiration date. Martins joined the Russian side from German club Wolfsburg in 2010 for a fee in the region US$10million. But his stint at the club was blighted by injuries and loss of form, forcing the team to banish him to the reserves. The former Newcastle United and Birmingham City forward was also omitted from the club's Europa League squad. Levante had tried to sign him during the transfer window last month but his wage demands scared off the financial-stricken side. It appears that Martins has taken a massive pay cut to fulfil his desire for regular football. The player is expected to fill the void created by the departure of Ivorian Arouna Kone, who joined Wigan Athletic.